From the start of her campaign, Hillary Clinton has promised an "economy that works for everyone." Her Republican rival Donald Trump preaches the economics of "America First," while Clinton's vision is "Family First." As she said in her speech at the Democratic National Convention, "We will help you balance family and work." She stresses programs like universal pre-school and paid family leave that will make their lives easier. In short, Clinton's plan is to boost government spending. She intends to tax the rich and redistribute that wealth to benefit the middle class and poor. The heart of her proposal is a massive increase -- $275 billion of new spending in her first term -- to rebuild America's roads and bridges. Economists across the political spectrum call it her best economic idea. In fact, Trump likes it too, recently saying he wants to spend double what Clinton does. Pretty much everyone agrees that America's infrastructure needs an upgrade (Vice President Joe Biden compared one U.S. airport to a "third world country"). Besides improving roads and highways, it would create jobs and boost economic growth. On the campaign trail, Clinton often cites a Moody's Analytics report that concluded her plan would create 10 million jobs. But Clinton thinks a healthy economy is about more than jobs. She wants to give people more government support and programs to "empower Americans to live better lives." In many ways, her plans today are an extension of her 1996 book on parenting, "It Takes A Village." 1. Paid family leave, so new parents can take time off without losing their jobs. 2. Preschool for every 4-year-old in America, to boost education and lower child care costs. 3. Debt-free college. She's not saying "free." But she wants to provide an option for lower and middle class students to attend a public college without having to go into debt. 4. Expanding Social Security, to ensure widowed women and people who take time off work don't lose out too much on receiving full benefits. 5. Raising the minimum wage, nationally, to $12 to $15 an hour (it's currently $7.25 an hour). 1. Americans who make over $1 million a year would pay at least 30% in federal income taxes. (It's often called the "Buffett Rule" because famed investor Warren Buffett supports it). 2. Americans who make over $5 million annually would pay an extra 4% "surcharge" each year. 3. The "estate tax" would go up. Estates worth more than $3.5 million would have to pay taxes when someone dies and the property goes to a child or other heirs (today only estates over $5.45 million pay). 4. Deductions would be limited to 28% of your tax bill to make it harder for the rich to find ways to pay very little taxes. (For high-income filers, that means a $100 deduction could only reduce one's tax bill by $28). Two expert groups -- the Tax Foundation and the Tax Policy Center -- ran the numbers. 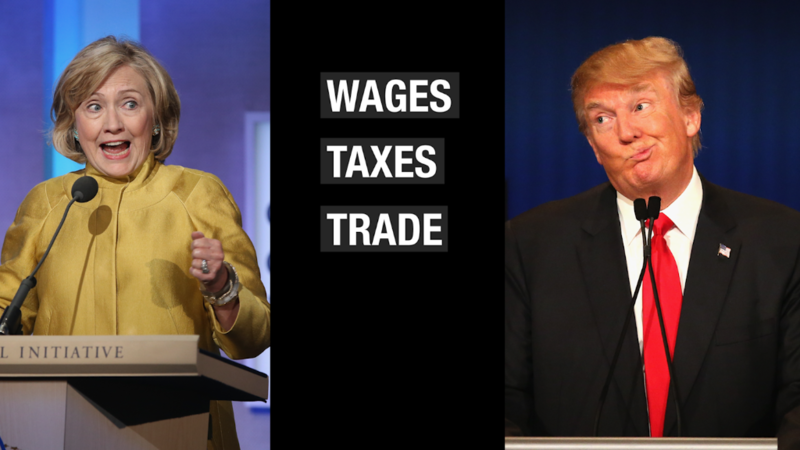 Both found that Clinton's tax plan would generate a revenue surplus. It's unclear if it would be enough money to pay for all of her proposals, but it would go a long way toward that goal. The final piece of her economic plan is immigration reform. Trump has been clear he wants to restrict immigration and deport millions of illegal immigrants. In contrast, Clinton is calling for a "path to citizenship" for illegal immigrants and an expansion of immigration opportunities for highly-skilled workers. Economist Mark Zandi of Moody's Analytics says this kind of reform would make the U.S. workforce bigger and stronger and that will boost growth. "Comprehensive immigration reform will grow our economy and keep families together -- and it's the right thing to do," Clinton says.